Carnival Cruise Line is launching a custom-built 360-degree interactive video player on its content hub, Away We Go, on April 27. The travel company recently launched a 360-degree video campaign created by global creative agency Arnold Worldwide that gives consumers an immersive cruising experience from ship to shore. Created in collaboration with Facebook and Google technology, Carnival claims to be the first company in the travel category to use a high-impact digital unit for a 360-degree video. Illustrating the cruise experience in the cluttered online space is challenging, says Stephanie Leavitt-Esposito, director of social media and branded content at Carnival Cruise Line. “The beauty of 360 video allows us to really illustrate the sights, sounds and feel of cruising Carnival — sunsets at sea, staterooms and water slides included,” Levitt-Esposito tells Marketing Daily. “We’re really hoping that the new technology and media placements will capture consumers' attention." Starting April 22, targeted consumers started seeing the 360 video, accompanied by a voiceover narrative, in their Facebook newsfeed and in Google Lightbox units. 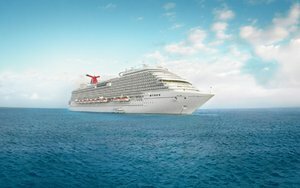 The 360-degree video experience begins on the Carnival Breeze as the cruise director encourages viewers to explore the ship. From a ride down Carnival’s WaterWorks waterslide, to a tropical cocktail at sunset to an aerial drone view of 7-Mile Beach in Grand Cayman, consumers can choose their own adventure as they take in the sights and sounds of a cruise vacation. The Facebook- and Google-supported portion of the 360 video campaign will continue to run through the end of May. This launch represents a continuation of the cruise line’s strategy to bring the sights and sounds of a cruise vacation to life via digital and mobile technology. Carnival was a beta partner in last year’s launch of Facebook’s Canvas mobile-only ad units, which used a variety of dynamic photo and video footage and mobile gyroscope technology to tap into the feeling of wanderlust that many vacation-seekers experience.